by richardelliott	Posted in	Face, Lifestyle, Skin	on 30/01/2019 . Since their release, Dr Barbara Sturm products have been highly sought-after by many who wish to benefit from revolutionary anti-ageing properties. These beauty products are also a fan-favourite of celebrities, who can’t get enough of the protective, detoxifying and strengthening results that Dr Barbara Sturm offers with her range. The latest celebrity to endorse this fantastic line is Victoria Beckham; she recently shared with her millions of followers that she’s been using Dr Barbara Sturm to maintain her glowing skin. Here, we’ll take a look at how you can achieve the same glow by using this product range at home. Victoria Beckham enjoys switching up her skincare routine and sharing new finds with her fans. Previously, she revealed that her daughter, Harper, had received a ‘baby facial’ treatment in Germany from Dr Barbara Sturm; Beckham also let her followers know that she had her blood drawn to create a pot of face cream – the famous ‘vampire facial’ that Dr Sturm was first known for. Given Dr Barbara Sturm’s popularity, it’s not surprising that Victoria Beckham started using other products in the range, from pills to cleansers. While it’s clear that Victoria Beckham loves Dr Sturm’s products, she’s not the only celebrity who swears by them. In fact, plenty of other public figures have expressed how much they love the range, from Rosie-Huntington-Whiteley, Kate Moss, Hailey Baldwin and Irina Shayk, to Angela Bassett, Cher, Kim Kardashian West, Gwyneth Paltrow and Emma Roberts. And the list keeps on growing. Do you want to have fantastic skin just like your favourite celebrities? You can achieve the results you’re looking for at home with Dr Barbara Sturm; however, it can be a bit daunting to decide which products are best for you, especially considering that there are so many great options in the range. But don’t worry – our skincare specialists here at Skinstation know exactly how to help. Why not start by preparing your skin with the Dr Barbara Sturm Anti-Ageing Primer? This multi-tasking primer combines anti-ageing properties with makeup benefits; it also has a lightweight silky soft texture. Perfect for nourishing your complexion, the advanced antioxidant protection this primer offers will give your skin an intensive boost of moisture that will reduce the appearance of your wrinkles, as well. We believe it’s also important to take care of the inside and Dr Barbara Sturm Skin Food – which Victoria Beckham is a particular fan of – is a great way to start. The supplements are boosted with Purslane, a super plant that improves the body’s hyaluronic acid and helps to reduce the appearance of wrinkles. This means you can feel and look younger for longer. A glowing complexion like Beckham’s can be achieved with a good cleanser, as well. Beckham likes to exfoliate with the Dr Barbara Sturm Enzyme Cleanser which, in her words, ‘is a fine grain cleansing powder, and it smells super nice and feels really nice when it goes on the skin’. This two-in-one cleansing foam and exfoliator removes dry and rough skin and reduces excess oil, leaving your complexion smooth and revitalised. These aren’t the only Dr Sturm products that Victoria Beckham endorses; she’s a fan of the Dr Barbara Sturm Face Mask, too. It’s not difficult to see why; this powerful product is a deeply hydrating mask that will leave your skin silky soft and smooth. The Purslane in the formula protects against free radicals and the Aloe Vera, Vitamin E and chamomile add a nourishing and soothing element to the mask. 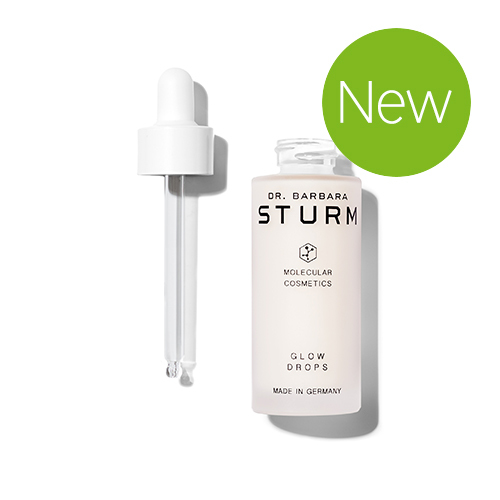 You may want to add Dr Barbara Sturm Glow Drops to your routine, as well. This product has been designed to make your complexion glow by revitalising and transforming dull skin. Your skin tone will be evened out due to the wild rose extract that will refine your pores, and you’ll benefit from a fresh and natural glow. This gentle serum is incredibly versatile, as you can apply it in several different ways; mix it with your face cream, over your makeup or after moisturising. Dr Barbara Sturm products are designed to improve the quality of your skin, as well as its structure. It will also contour and firm your complexion. Packed with natural ingredients and antioxidants, the products will ensure that your skin is strengthened and rejuvenated at the cellular level; you can also be confident that issues such as inflammation and dry skin will improve, too. If you wish to learn more about the Dr Barbara Sturm range and achieve the same glowing skin as Victoria Beckham’s, let us know – we’ll be able to answer any questions you may have and are happy to help you create a skincare routine you can stick to.